Aqua (Water), Perfluorohexane, Glycerin, Perfluorodecalin, Perfluoroperhydrophenanthrene, Oxygen, Phenoxyethanol, Pullulan, Sodium Hyaluronate, Perfluorodimethylcyclohexane, Ethylhexylglycerin, Palmaria Palmata Extract, Rosa Damascena Flower Extract, [+/- Synthetic Sapphire, Mica, CI 77491 (Iron Oxide), Synthetic Fluorphlogopite, CI77891 (Titanium Dioxide)]. Look at it as a tool, working for the skin and asking no work in return from the skin. It is for everyone whose skin is showing signs of tiredness, and for older skins that need an everyday pick-me-up and de-wrinkling help with regular use. 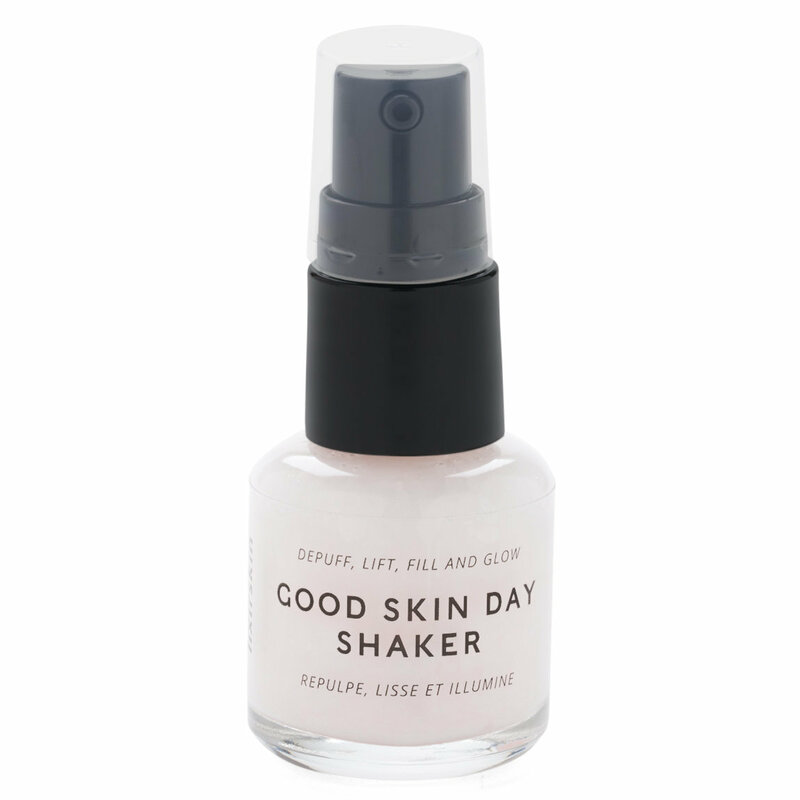 Good Skin Day Shaker solves an age-old skincare conundrum: how do you simultaneously fill in and depuff? It is hard to deliver one thing and its opposite – plumping here to resurface wrinkles and depuffing there, often around the eyes. The perfect solution is a two-phase product that rapidly delivers on both fronts. This a bi-phasic formula that, once shaken, does it all. The top phase is a juice of Hyaluronans that keeps cells tightly together to rapidly smooth and lift, combined with algae-derived minerals that boost micro-circulation to help drainage, depuff and reduce dark circles. The bottom phase is perfluorocarbons gas carriers retaining oxygen to boost cellular respiration and radiance, increase epidermal volume and help reduce contraction of innervated muscle cells to fill in wrinkles. Signs of fatigue, dark circles and puffiness are reduced. Your skin quickly feels tighter, smoother, lifted and glowing from within. Sagging is reduced and lines appear less deep. After moisturizer, shake well and apply two pumps with gentle pressing and giving special attention to eye contour. Reapply as needed during the day, including over make up.